Since February 21, 2018 students at Tata Institute of Social Sciences, India (TISS) have been striking against the changes in the Government of India–Post Matric Scholarship (GoI-PMS), which leads to the withdrawal of scholarship of students belonging to Scheduled Castes (SC), Scheduled Tribes (ST) and Other Backward Classes (OBCs). Despite regular threats by the TISS administration, students belonging to different political ideologies have remained united and are protesting together. This protest also comes in the wake of disproportionate increase in fees over the years. With increasing fees, there is regular decline in the enrolment rate of students belonging to socially and economically poor backgrounds at TISS, which is perpetuated by deliberate ineffectiveness in scholarship delivery mechanisms. With constant reduction in the fund for research and higher education in social sciences in India, the situation at TISS is a mere reflection of an emerging crisis in higher education. The privatisation of education by means of regular fees escalation, fund cuts, and withdrawal of support from the economically and socially deprived sections of society, has to be analysed within the broader neoliberal turn within the education sector in India. And without doubt, these economic policies make students belonging to socially and economically poor background immediate victim. 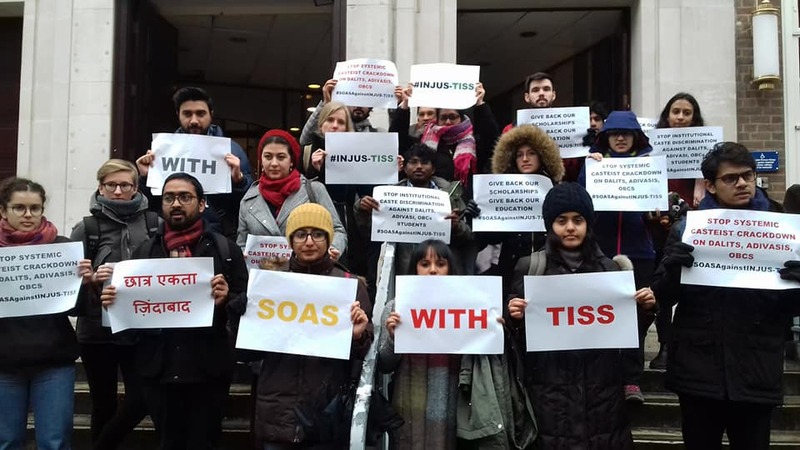 Students at SOAS are also experiencing the growing trend of privatisation and commodification of education and similarities can be drawn with TISS’ experience to the extent that there is a constant push towards commodification and marketisation of education. Nonetheless, there have been regular debates in higher education institutes in UK and elsewhere to decolonize campus and curriculum, stressing the need to make university spaces and education experience, inclusive and accessible. However, we are conscious of the fact that the Indian experience is also an outcome of larger caste-based systemic discrimination where education is the only social capital for Dalits, Adivasis and marginalized sections of the Indian society to fight social exclusion and caste discrimination. #InjusTISS faced by SC/ST/OBC students is inherently a systemic problem, based on caste. A problem which essentially denies access to education to millions of marginalized and is privy to destroying the young generations of Dalits, Adivasis and OBCs by effectively making the scholarship policy ineffective, frustrating the reservation policy in India. As students we believe that financial assistance and scholarships are the only means to access education for marginalized sections. It should be stressed that in the absence of scholarship or financial assistance, many students would not have been able to access education at institutions like SOAS. We the students of SOAS reaffirming our commitment to fight against the casteist and neoliberal onslaught on access to education of marginalized communities, and state’s complicity in perpetuating such systemic discrimination. We stand in full support and solidarity with students at TISS campuses in India, who are fighting to regain their right to education and social justice for Dalits, Adivasis and OBCs.